2007 Ponzi Pinot Blanc, Willamette Valley ($17) Super pale, medium +body, savory fruit aromas. Flavors of coconut and lemongrass. 2006 Domaine Serene Chardonnay, Clos du Soleil, Willamette Valley ($45) Apple custard tart aromas, with a whisper of banana Laffy Taffy. Flavors of sour apple and slight taste of bell pepper and something somewhere between herbal and green. 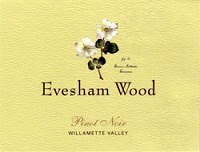 2007 Evesham Wood Pinot Noir, Willamette ($20) Delightful small producer discovery. Initial scent of kerosene revealed secondary aromas of complex fruit including Jolly Rancher cherry. Flavors were also sour cherry and cherry fruit roll-up. A cool climate pinot, it had good acidity. Yes. I bought this! 2007 Ponzi Pinot Noir Tavola ($26) This is what the Ponzis keep on their kitchen table. Lovely plummy nose. Good acidity to stand up to food. Flavors had a strong presence of fruit, red plum. 2006 Domaine Serene Pinot Noir, Yamhill Cuvee, Willamette Valley ($42) Aromas of violets. This was a perfumey wine, with cherry, red fruit and fennel. It had an interesting pleasant finish with initial vinegary notes turning into red fruit and then coffee. Good friends. Good times and all on a budget! Viva las Recessionistas! Wow, sounds like quite a day! You know, I've never actually made it down to the Wine Mine for those Saturday tastings. I gotta do eeet! Ponzi Pinot Blanc 2007 got an 89 from Tanzer. You know what to do. And just in time for the contest, too. Ward--- THanks for reading! ANd yes, you absoluement neeeed to veeeseeet Le WIne Mine, See you there!